The second release from Shirley Jackson & Her Good Rockin’ Daddys continues with a selection of tunes rooted in various blues styles as well as some new tunes written by Shirley Jackson; shuffles, swing tunes, and a few trips south of the Canadian border. Like the description mentions, this is the second release from Shirley Jackson & Her Good Rockin’ Daddys. 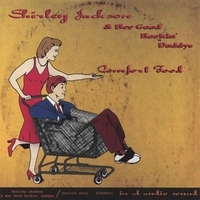 'Comfort Food' continues with a selection of tunes rooted in various blues styles as well as some new tunes written by Shirley Jackson; shuffles, swing tunes, and a few fun trips south of the Canadian border; released in 2007. 'Comfort Food' Was nominated for and East Coast Music Award and Nova Scotia Music Award for Blues Recording of the Year, 2008, and a Nova Scotia Music Award for Blues Recording of the Year, 2008. 'Comfort Food' features some musicians from the GRD's debut release as well as some new friends! "One of 2007’s most surprising and, ultimately, rewarding releases is the brainchild of award-winning Tenor Sax stalwart Shirley Jackson and her handpicked crew, compromised of the cream of the Maritime blues and jazz crops."